Wine and olive oil have a common enemy – oxygen. It oxidizes their flavors and aromas so that they loose their complexity, become boring and dull, and may even acquire defects. What is the cheapest and the most effective way to protect your wine and olive oil at home? Use a aerosol spray can filled with argon, a noble and inert gas that forms a protective blanket on the liquid surface. In wine oxygen works faster, partly because there are also acetic bacteria that will use it to turn alcohol into acetic acid. Wine that remained in a closed half finished bottle for just 24h will already be altered and in few days it may become even undrinkable so that you can either pour it down the drain or try to make your own vinegar. What to do if you would like to take five bottles of wine and open them at once (of course, not to get drunk, but just to taste different flavors and aromas one after another, or to change wine with each course)? Or, you own a wine bar or a restaurant that serves wine by glass and would like to keep the wine quality unaltered? There are several methods which can slow down or completely stop wine spoilage. The simplest one is to put the bottles in the fridge. In that way, the acetic bacteria reproduce more slowly than on ambient temperature. From my experience, this method is applicable only for one day and the results are not very good because you do not prevent aroma and flavor oxidation. There are observations that intense reds will loose the flavor intensity and acidity when kept only for a day in the fridge. 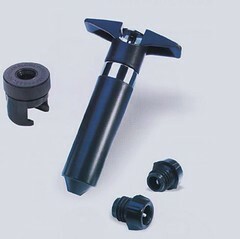 The second method is to use a wine saver vacuum pump. According to this post, the pump is worthless since the sucking pressure it generates is too low to remove much air from the bottle. Nevertheless I should give it a try; maybe it is effective at least for 3-4 days that is enough time to consume the entire bottle? 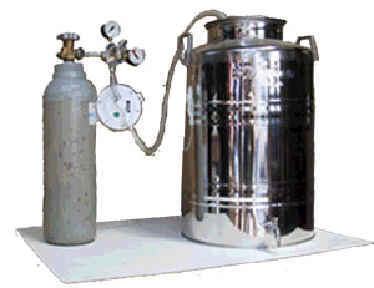 The third method is to replace air in the bottle with some non-oxidizing gas. In case of olive oil only the third method is used. In fact, before bottling the oil is usually stored in large stainless steel tanks in which large surface of oil comes in contact with the air. Oil oxidizes more slowly than wine – a month or two are needed for any perceptible change in aromas and flavors. The worst thing it may happen is that the oil in six months can even get rancid and therefore loose its precious extravirgin status. Which gas is used in the third method, knows also under the name tank blanketing? The most common is nitrogen since it is cheap and easily available. The problem with nitrogen is that it has density of 1.251 g/L which is comparable to the density of air (1.2 g/L), so the pressure of nitrogen inside the tank needs to be kept constant. Therefore, you need to buy an expensive bottle and a pressure controler connected to your container (see the picture above). Argon, on the other hand, is heavier (1.784 g/L) than air which makes its usage much easier. You need to buy it packed in aerosol spray can can so there’s no need to bother with valves, tubing and pressure controllers. It is enough to gently spray it for 2-3 seconds in the bottle or stainless tank and heavy, inert argon molecules will sink down and form a protective blanket on the liquid surface (surface blanketing effect). The oxygen will no longer be in contact with the liquid. Gives an application to about 120 bottles of 0.75 L. It is ultra high purity argon sold for laboratory use. It is also completely suitable for alimentary use, but its price way too high. We need to find something cheaper. Again, 120 bottles of 0.75 L can be preserved. It is a mixture of nitrogen, carbon dioxide and argon that are all gases suitable for oxygen blocking. The gas mixture density, a factor important for efficient surface blanketing, is not specified. I presume the manufacturer have put inside more argon and carbon dioxide (heavy gases) than nitrogen (light gas) to keep the average density at least 30% higher than the air density. Same as above but cheaper. Here is the manufacturer website. Very similar to Private preserve. It is not pure argon but a mixture of oxygen blocking gases (probably also nitrogen, carbon dioxide and argon). 99.99% Argon. Very nice and ergonomical design. One argon cartridge ($2.75) gives an application to about 18 bottles of wine. 120 bottles of 0.75 L can be preserved. I checked the composition and they claim it is 100% Argon. Disclaimer: This product is sold for preserving unused finishing materials. The exact composition should be double checked with the producer to see if the product is suitable for alimentary use. Hope I did not bother you too much with such a long and technical article. I think it will be useful to many wine and olive oil enthusiast in Istria who have never heard of this cheap and useful technology. I like to know the scientific side of things! A question for Dr. Gogo: I was picking olives this week-end and their juice is red-pink!purple. So how come the oil is fluorescent green? By the way we tried your new olive oil at Boris’ and it is absolutely delicious. Very fruity, me likes! Interesting question, but I am not sure if my answer will be correct. The juice you get when you squeeze the olive is full of water. The last process in the olive milling is centrifugation where you should get rid off of the water. Since the molecules that give the color to a liquid can be either water-soluble or oil-soluble, probably in that way you also remove the molecules that are giving red-pink-purple color. Je me suis dit que ça t’intéresserait peut-être, un blog français sur la nourriture en bande dessinée. Le dernier post se passe en Italie, ça m’a rappelé nos aventures à la recherche de la meilleure trattoria ! Merci, merci infiniment pour ce lien! Je suis vraiment jaloux. L’autour dessine très bien, il est un BDiste très douée. (comment on dit stripaš en francais?) Et les dialogues sont pour mourir de rire!!! Peut-être on peut lui envoyer l’histoire qui c’est passé cette nuit à Cosenza? Imagine un BD avec la montée de notre bus sur cette virage, puis arrivée de camion sauvetage, puis cette épisode surréaliste dans le Bingo center ou on a cherché les pizzas e la fin dans cette pizzeria magnifique… A la fin on n’as pas vu le resto Pantagruel, quelle tragédie. Sinon, Il est vrai que le bon pan c’est difficile de trouver en Italie, en Croatie il est bien meilleur. Would pure argon gas be good for preserving wine? 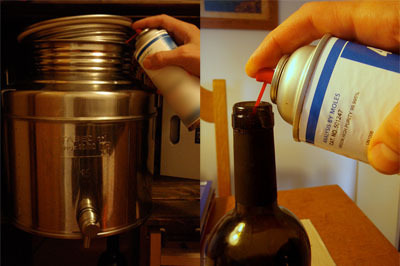 Of course, argon can be used to stop any deterioration of wine once you open the bottle. It will take place of oxygen and won’t make any chemical reaction with wine since it is an inert (noble) gas. In that way, wine’s aromas and flavors won’t oxidize and they will remain equally intense and of unaltered quality over time, usually a week or two. But also argon will prevent that wine turns into vinegar. it’s very interesting to use Aerosol to flush Nitrogen and it’s cost effective and handly. May i know how much volume or quantity of Nitrogen gas recommended to flush per liter of olive oil? is there any standards approved by FDA or IOOC? I used aerosol bottle filled not with nitrogen but with argon. Argon is better since it is heavier than air so it forms a sort of protective blanket on liquid surface. I just spray it for 2 seconds and that’s it. I don’t know about the FDA or IOOC standards since I use that technique only at home, mostly for the stainless steel container where I keep my olive oil. For small quantities is more convenient than to install expensive nitrogen flushing system. Hi yes, argon aerosol isn’t readily available; how suitable is carbon dioxide for blanketing extra virgin olive oil? As Carbon Dioxide is heavier than air it could be an option, too. I want to know for example a 1000 litre stainlessteel tank how long in seconds must you open the argon gas bottle (11kg) to determine when enough gas is put into the tank and will you say for 2000 litre you must put double the quantity in as for the 1000 litre tank?